Gather all of your research notes, ideas, links, and web clippings into one free-form knowledge base. Pull together materials from many sources. Personal Knowbase makes managing a large amount of information easy by using a natural way to retrieve notes, using keywords to filter for related information. Take control of your notes with Personal Knowbase. Save time with convenient note-taking. Record and modify notes quickly without having to navigate deep data trees. Access everything you've stored for one topic by just selecting a keyword or two. Keep all your information for one project together by linking to external files and Internet addresses. Handle large numbers of notes easily. No limits on number or length of records. 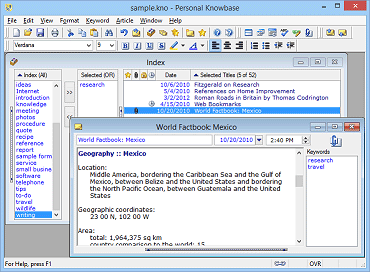 Personal Knowbase is index card software for Windows desktop. Managing notes. Research notes. Reference materials. Interview notes. Annotations. Sources. Lists for ongoing projects. It's a great tool for academics and librarians. You can do your note-taking directly into Personal Knowbase, or gather your paper notes and import text files into your database later. When you're working and think of something else that you need to look up later, just jot down a quick note in a PK article, tag the article, and easily get back to it as soon as you're done with what you're currently working on. Saving web clippings. Drag in snippets from online sources. Store abstracts from online databases. While browsing, copy facts into PK and know you'll be able to find them later when you need them. Or store a link to the web page for later reference. Storing account information. Keep account info for online databases, forums, and membership sites. Password-protect your PK database for added privacy. Organizing large databases. Manage historical research, genealogy notes, thesis data, or other large projects. Recording resources. Create bibliographies and cross-reference notes to their sources. Assign each source a unique keyword. Then create a PK article for each source's information. Assign that source article and all articles which use that source the same unique source keyword. Then, when you select that keyword, the source information and everything related to it will be listed. You can also use hypertext links to link from a note to the article containing its source information. Hyperlinks can point to URLs, external files, or other PK articles. ...I know there are many Local, State and Federal agencies and private researchers who would love this program.